We currently serve more than 80 adults with I/DD at our main adult services center. Daily programs include continuing adult education, computer skills training, recreational activities, a variety of art classes and more. In addition, we have recently added Hippo Therapy to our curriculum. It promotes the use of the movement of a horse as a treatment strategy for people living with disabilities. 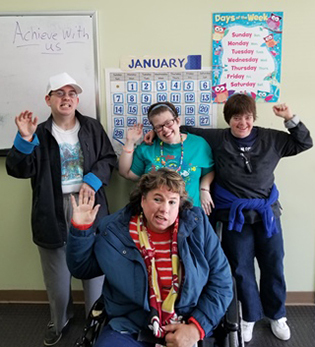 Our goal is to provide meaningful day activities for adults with I/DD that build confidence, self-esteem, listening skills, fine and gross motor skills, critical thinking and problem solving. Additionally, we provide an opportunity for people with I/DD to have a sense of normalcy through daily activities in which they can make friends, socialize, and develop interpersonal skills.